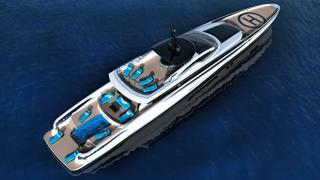 Van Oossanen Naval Architects has revealed more details of its 47.5 metre Fast Displacement XL-300 Sport concept, which was developed in partnership with Milanese designer Federico Fiorentino. As the new rendering below shows, the XL-300 Sport would feature a large superyacht sundeck with enough room for four sunloungers back aft and a circular dining table amidships. This motor yacht would ride on the signature Van Oossanen hull form and would feature with a total interior volume of less than 300GT. 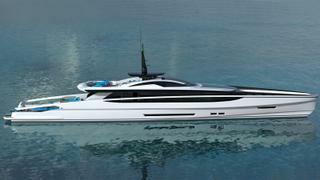 What's more, Thom Conboy of Ocean Independence will be marketing this concept as a yacht for sale. The XL-300 is a follow-up to the 61 metre Fast Displacement XL-500, which was designed in collaboration with Cor D Rover and revealed at the 2016 Monaco Yacht Show. The exterior styling was provided by Fiorentino, who is described by Perry Van Oossanen as “one of the most talented designers we have worked with”. What’s more, Cristiano Gatto has been approached to create the interior décor for this sleek cruiser, but no renderings of his designs have been released so far. Accommodation is for ten guests split across five staterooms, including a main-deck owner’s cabin as well as three doubles and a twin cabin below decks. The crew quarters would be situated in the bow, accommodating six people in three en-suite cabins. Key features include a superyacht helipad on the foredeck, an aft-deck infinity pool and a side-loading garage that is large enough to house two Jet Skis as well as a 6.25 metre tender. Van Oossanen adds that this design could be built from an aluminium hull and superstructure to LY3, RINA or ABS standards, but no build partner has been chosen at this stage. Power would come from twin 2600hp MTU 16V2000 M96 diesel engines for a top speed of 29 knots and a maximum cruising range of 3,800 nautical miles at 12 knots. Meanwhile, a pair of Seakeeper M35 stabilisers with active interceptors would ensure a smooth cruising experience for all those on board. Van Oossanen and Fiorentino last collaborated in 2015 to produce a 50 metre superyacht concept called The Belafonte.